Evesham Accommodation - The market town of Evesham, located in the Vale of Evesham (the fruit and vegetable basket of England), is a busy old market town beside the picturesque River Avon. The town offers good and varied shopping with its fair share of cafes and restaurants. Evesham is on the borders of Worcestershire and Gloucestershire and only 10 minutes away by car from Broadway and the North Cotswolds. The City of Worcester is 25 minutes away. Warwick castle and Stratford on Avon to see a Shakespeare play. Situated 2.5 miles from the centre of Evesham, this 4-star hotel boasts 50 modern equipped rooms, a restaurant and lounge bar, meeting facilities and a garden. Free on-site parking is also available. The traditionally decorated rooms feature flat screen TV’s, tea and coffee making facilities, complimentary toiletries and free Wi-Fi. 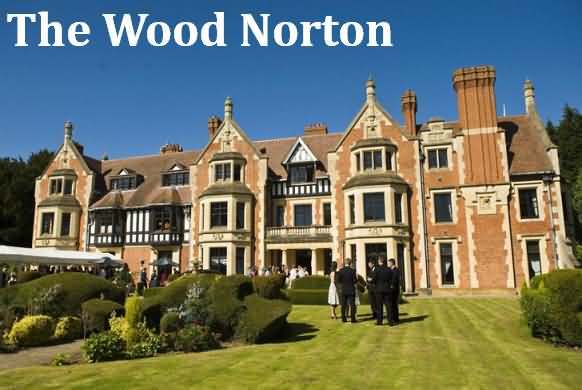 Guests at the Wood Norton can enjoy some wonderful views of the surrounding garden from the dining room and relax with a few drinks on the terrace during the warmer summer months. Modern British cuisine is on offer at the hotel’s restaurant, where dishes are prepared using local produce whilst a wide variety of drinks as well as afternoon tea are available at the bar. Worcester Cathedral is a 25-minute drive from the hotel and Birmingham is 48.3 km away. The picturesque towns of Stratford-upon-Avon and Cheltenham are both under an hour’s drive away . Nestled on 19 acres of gardens and woodland, this 19th century country house provides the ideal base from which to explore the rolling hills and hidden valleys of the Cotswolds. Located 6 miles from Evesham. 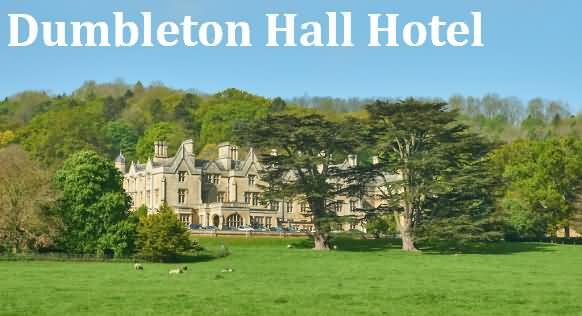 Set in the beautiful Worcestershire countryside, surrounded by stunning views of Bredon Hill, Cotswold Hills and Broadway Tower, this impressive mansion offers a warm welcome with its magnificent oak-paneled lounge, comfortable bar and restaurant. For business events and special occasions, the hotel provides 2 individually styled function rooms, one of which boasts a dance floor, suitable for up to 100 people. This property also has one of the top-rated locations in Dumbleton! Guests are happier about it compared to other properties in the area. This friendly, award-winning hotel boasts unique, individually designed rooms and a swimming pool. Fresh, full English breakfasts are served, and Evesham’s centre is just 10 minutes’ walk away. 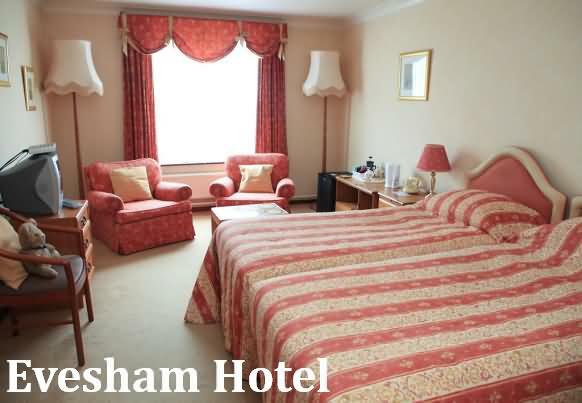 Spacious and beautiful, every room at Evesham Hotel is completely individual, with its own colour scheme, decor, and unique features. Free Wi-Fi is available, along with a private bathroom with free toiletries. Some rooms provide historic wooden beams and original features. An extensive breakfast menu is served each day, ranging from traditional cooked breakfasts, to black pudding or kippers. There is a varied lunch buffet, along with a number of menus for lunch and dinner. Room service is also available. Guests can relax at the hotel with table tennis, table football, and an indoor swimming pool. 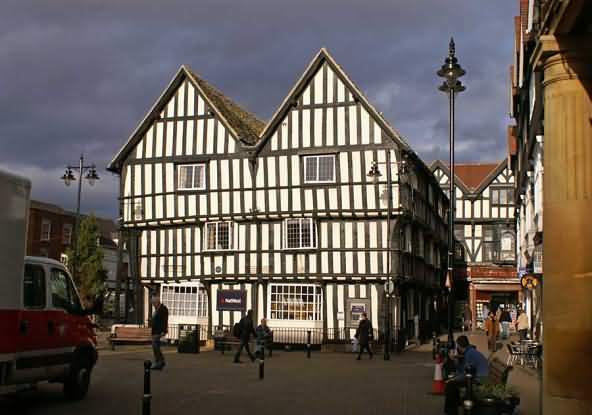 Free parking is available, and the shops of the pretty market town of Evesham are near to the hotel. Historic Stratford-upon-Avon, home of William Shakespeare, is a 30-minute drive away, while Worcester, Cheltenham, and Warwick are also 30 minutes away by car. This property also has one of the top-rated locations in Evesham! Guests are happier about it compared to other properties in the area. The family room has two double beds (one being a sofa bed) together with an en-suite shower. The room enjoys fantastic views over the large garden, paddocks and beyond. For families with babies and very young children a cot is available in the room. If you need to use this facility please let us know when you book your room. 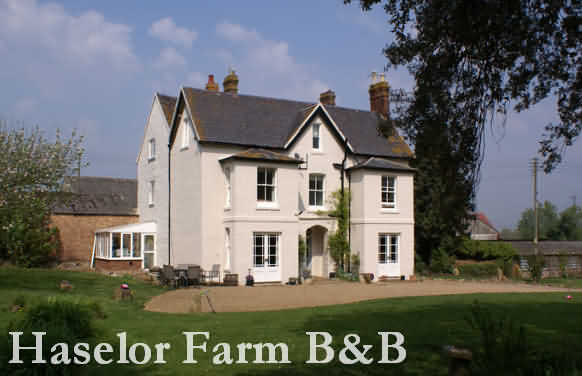 £80 per night (£45 single occupancy). 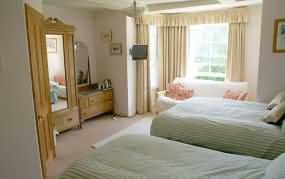 This twin room has an en-suite shower and enjoys fantastic views over the large garden, paddocks and beyond. The room also contains a double bed, double sofa bed and single bed making it ideal for families. For those with babies and very young children a cot is available. If you need to use this facility please let us know when you book your room. 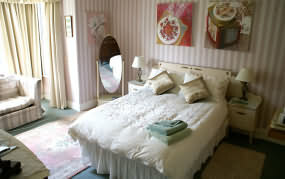 £80 per night (£45 single occupancy). £15 for each child under 12 (over 12 please contact). This lovely spacious room has en-suite shower facilities, offering the choice of two single beds or these can be made into a superking bed. This room enjoys lovely views across the grounds, and fields beyond, it also has flat screen tv with dvd. tea/coffee etc. There is also a fridge on the landing for guests to use whenever, with fresh milk etc. A warm and friendly welcome awaits. Open all year. Credit Cards Accepted. A comfortable farmhouse in the centre of the village of Ashton Under Hill at the foot of Bredon Hill providing excellent access for enjoying the surrounding countryside. Holloway Farm House, a non-working farm, is conveniently situated for visiting the Cotswolds, Tewkesbury, Stratford, Warwick, Broadway, Worcester and Cheltenham. There are excellent walks on Bredon Hill and the Wychavon Way passes through the village. Accommodation consists of one twin room with ensuite shower & wc and one family room with double and single bed with private bathroom. 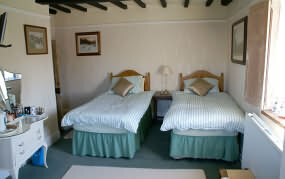 Holloway also offers a double bedroom apartment at selected times of the year which can be used as self-catering or B&B. There is also a good local pub where bar meals are usually available. Modern 6 berth caravans with showers, flush toilet, microwave, cooker, refrigerator, colour TV, double glazing and central heating. Based in the centre of our 200 acre farm. Although we specialise in fishing and golf, these caravans would suit anyone wanting a quiet holiday in the country. Static caravan prices range from £345 per week. You can download a tariff from our website prices page. Static caravans for sale - please contact us for details. We also cater for a limited number of tourers and tents and have a toilet/shower block for their use. Touring caravan prices range from £12.00 to £14.00 per night basic rate. We have a superb six lake complex, predominantly stocked with carp, bream, tench, perch, roach and chub. We also have a prime stretch of the Warwickshire Avon, famous for its barbel and chub. We have a 9 hole short course and an 18 hole par 64 pay and play course.